Community Link Foundation has awarded a grant to Autism Ventures to enable four people to take part in a work placement scheme. | Making a positive difference! Community Link Foundation has awarded a grant to Autism Ventures to enable four people to take part in a work placement scheme. Board members from CLF met recently to discuss the grant applications and awarded £2000 to Autism Ventures that offers meaningful commercial work experience and training within a supportive environment to people with autism. The work placements within the social enterprises help to develop work, behavioural and social skills which will enhance their lives greatly. The funding from Community Link Foundation will directly help four people with high functioning autism or Asperger’s Syndrome. It is part of a wider project aiming to provide at least 22 eight week training and work placement opportunities for people with autism over the next 12 months. Since Autism Ventures launched its first social enterprise back in 2010 around 80 people with autism have gained valuable experience for both life and work. They will be provided with an eight week work placement and onsite training at one of the four social enterprises in Southport which will include support from a specialist autism practitioner who will tailor each work placement to meet the specific needs of each individual and to accommodate the way each is uniquely affected by autism. 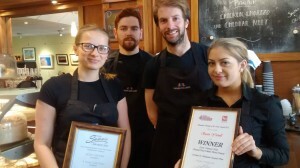 The social enterprises are A Great Little Place, award winning cafes in Southport, We Grow Co, award winning vegetable growing and delivery based in Churchtown and MeCycle bike shop and cafe in Ainsdale. Enda Rylands, chairman of Community Link Foundation, said: “We are so pleased to be able to help Autism Ventures with these work placements. The placements that they offer can really make a huge difference to these people’s lives. The placements will start in September 2016 and end in March 2017. Jon Gordon added: “Our experience in supporting people with autism enables us to maximise their ability to the full. We support them to develop a range of personalised strategies to use in learning further skills for life. The social enterprises encourage inclusion, concentrate on sustainability and provide a host of wider community benefits and help the trainees develop new skills and to increase their confidence and self-esteem. For more information about Community Link Foundation, go to www.clfoundation.co.uk and for more on Autism Ventures, go to www.autisminitiaitves.org.